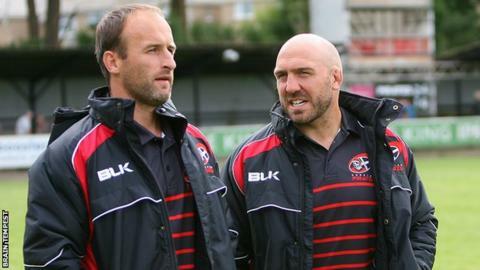 Cornish Pirates prop Alan Paver says he is "over the moon" to be called up to play for the Barbarians. Paver, 36, is joined by scrum-half and fellow Pirates coach Gavin Cattle for the match against the Combined Services on 11 November in Bath. Paver was selected for the Barbarians in the same fixture 12 months ago but was forced to withdraw. "Last year I got injured so it was pretty disappointing, so to be asked again is fantastic," said Paver. "I feel over the moon, it's something I've wanted to do for a long time," he added to BBC Radio Cornwall. "I've got Gavin Cattle next to me and it's lovely to do it with him because we've been through quite a lot of stuff together and just to have that opportunity to go and play and get the shirt is marvellous." Cattle, who took over as backs coach late last season, agrees that playing alongside Paver will make the game even more special. "I played against the Barbarians at the opening of the Parc Y Scarlets, but I've never played for them so I'm glad to be putting on that famous shirt alongside my pal, which makes it a little bit more special," he said. "I've not had much chance to think about this Barbarians game yet, as I've been preparing the team this week."